On the tennis court Rafael Nadal is a gladiator fighting for his life; off it, he is a polite, infallibly gracious young man. Add success to the mix, add the grand slam of tennis titles he has won and his undisputed status as king of the modern tennis game, and what you have is a charismatic modern icon who translates across all continents, appealing to young and old alike. He is quite possibly the most compellingly engaging personality in world sports. As some of you already know, we’re hugely excited to be representing Rafael Nadal’s memoirs, written with the best-selling author John Carlin. We’re currently fielding offers from around the world. For those of you who have seen an earlier proposal, the author originally proposed writing the book in the third person. But upon conversations with various publishers around the world, he will now be writing it in Nadal’s voice, along with his own as a third person story-teller. The new proposal is attached. John Carlin is currently a writer for El Pais and most recently the author of PLAYING THE ENEMY, which has been translated into 16 languages and became the movie Invictus. There was tennis before Nadal, and there is tennis after him. Before, it was a sport defined by the exquisitely gifted Roger Federer, who danced across court, pinging balls of angled precision with Fred Astaire élan. Nadal, who trains harder than any tennis player ever has done, has patented a new game that combines the speed, stamina and rippling muscularity of an Olympic athlete with nerves of steel and the fighting heart of a professional boxer. Federer has more natural talent, but the blend Nadal possesses of physical strength and raw conviction have proved too much for him in six of their last seven encounters. Addressing the crowd at the end of the 2008  Australian Open, Federer, as if sensing that his defeat marked a passing of the torch, a transition from the old to the new, broke down. “God,” he sobbed, “it’s killing me.” Nadal seemed to feel Federer’s pain more than his own glory. “Roger,” he said, “sorry for today. I really know how you feel right now. Remember, you're a great champion, you're one of the best in history.” He meant it. He is that kind of guy. But “history” here was the operative word. The future, though he would have been the last to acknowledge it, belonged to Nadal. Nadal has won nine grand slam titles. Federer has won 16, more than anyone, ever. If Nadal is able win his own race against time, if he can keep his body clock ticking at the ferocious rhythm he has set himself, few would bet against him beating Federer’s record. Even if he does not, history will record that, single-handedly, beguilingly blending brute power and boyish charm, he changed the nature and character of the ancient game, capturing the attention of the world. 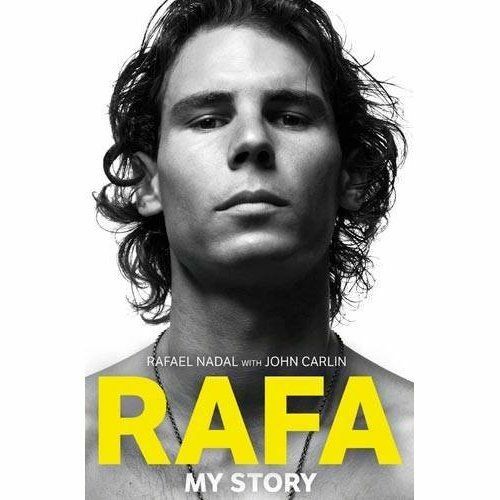 What is original and unique about this book is that it will be the first to tell Rafael Nadal’s story in his own voice. We will also count with the close collaboration of those nearest to him The suggestion for the book came from within the Nadal camp.On trips to Monte Carlo, whose annual tournament Nadal unfailingly wins, and Mallorca, where Nadal was raised and still lives, I spoke at length to Toni Nadal, Rafael’s lifetime coach; Rafael’s father, Sebastián, who handles his business affairs and to whom he is very close; his communications director and friend, Benito Pérez Barbadillo; and to a lesser extent, but no less encouragingly, with his agent, the former professional tennis player Carlos Costa. All were enthusiastic about the project; all have assured me that they will yield up as much of their time as is necessary, furnishing all the anecdotes and analysis and contacts required to help unlock the essence of Rafael Nadal as a champion and as a man. Most important of all, this will include many hours of interviews with Nadal himself. I will also watch him in training and, at Carlos Costa’s suggestion, spend time as part of the Nadal inner circle during at least one tournament during the first half of 2011. The book will be autobiographical in style, but not exhaustively so in terms of content. The focus will be on those elements in Nadal’s story that explain how he became the champion and the man that he is today. A big finding will be that Nadal is a self-made man only on the surface; the deeper truth is that he is an elaborate construct, that he owes his success to a core group of individuals, chiefly family members, who have stood by his side, cemented his values and helped build his personality on his journey from boyhood to world number one. Anecdotes -- gleaned mostly from Nadal himself, but also from family and friends -- will abound; analysis, too, chiefly from Nadal, but embellised, in large part, by his uncle Toni. The themes will be classical: the value of strong, loving families; of discipline and hard work; of digging deep to overcome adversity; of respect for all people. Implicitly, the Nadal’s story will serve as an antidote to the notion, widely propagated, that sports champions are of necessity tortured, recklessly self-absorbed, rudderless souls. The context, of course, will be the world of professional men’s tennis, right now perhaps the most compelling, most competitive sport there is. The purpose is to wrap all these elements within a pacy, page-turning, engagingly structured narrative. Rights available both in Hungary and Croatia.